Had a lovely evening yesterday. Went for drinks with a long-lost friend of mine, Cee. We used to work together, back in the Cape Town days, at Grapevine Interactive. Then she moved back up to Jhb, her home town. We did get back in touch when I first moved up here, but had pretty much lost contact in the last year. 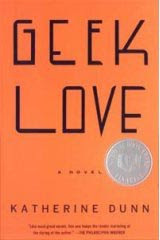 Oh, and this weekend I finished reading Katherine Dunn's Geek Love. Geek Love is the story of the Binewskis, a carny family whose mater- and paterfamilias set out-with the help of amphetamine, arsenic, and radioisotopes- to breed their own exhibit of human oddities. There's Arturo the Aquaboy, who has flippers for limbs and a megalomaniac ambition worthy of Genghis Khan . . . Iphy and Elly, the lissome Siamese twins . . . albino hunchback Oly, and the outwardly normal Chick, whose mysterious gifts make him the family's most precious-and dangerous-asset. A truly very odd story. And now I've just found out that TheBrad was hijacked on his way to work this morning. We have no further news other than he is probably still in the car. Apparently his mom saw it as it happened outside his house. I can't write anymore right now.